Library Garden: Participation in a 2.0 World--"Be the change you want to be"
Participation in a 2.0 World--"Be the change you want to be"
I love reading about and reports by Michael Stephens related to teaching librarians and others about Web 2.0 technologies, especially since I, too, am a professor and librarian, excited about the impact that Web 2.0/social software is having on individuals, not to mention entire libraries and their communities. Michael Stephens' Library Technology Report (LTR) from July/August 2006 (Vol. 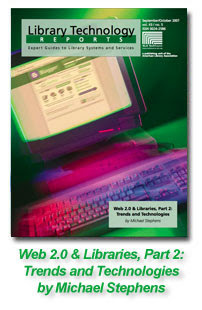 42, Issue 4) on Web 2.0 & Libraries: Best Practices for Social Software (now considered Part 1, I guess!) was one of my favorite reads last year--full of practical tips, tools, and techniques on how to integrate these types of tools into our library world. Well, Michael Stephens has gone and done it again, this time, with "Part 2." Michael stated that he wanted to focus this time on the best practices associated with the tools and trends for libraries by providing a "bigger picture instead of a list of each specific tool." I found this quite useful, and I highly recommend reading his current September/October 2007 Library Technology Report (Vol. 43, Issue 5 -- available for purchase from ALA and available full text from several databases, such as Factiva and Academic Search Premier), entitled Web 2.0 & Libraries, Part 2: Trends and Technologies. As he states in his recent blog post about these tools and technologies, knowing about all of this will be helpful for "planning, buy in and evaluation. So use these ideas as a guide to move forward with whatever tool you're adding to your 2.0 cadre: a library blog, IM reference, or a wiki. Remember, Web 2.0 tools won't solve all your problems, but you may find some solutions that will make your work-life easier." I just got back from a two-week leave, helping my son get established in his new life in the Army National Guard in Arkansas since returning from the Middle East a few weeks ago. I used several social software tools to stay in contact with him while he was gone. And although nothing can top my excitement of seeing him, in person, back safe in the U.S. after being gone for over a year, I think Michael's new report was pretty high up on my list of favorites last week. I think you will love this report as much as I did/still do. So, go on--"be the change you want to be." (emphasis/bold mine)--I plan on doing just that, this time right at my own library, so get ready Rider University Libraries. And thanks again, Michael.